Our @kickstarter for @popcatsfighter is now LIVE!! We’re at 20% already! Keep supporting us and our project by pledging to it today, and sharing it online! New Enamel Pin Alert! I’m debuting these pins at SDCC in my Small Press L-08 booth! They were inspired by my Painting Buddies Stickers pack, and I love them! Working on the iPad on some of the last cards for the game! Last but not least: Sticker #4 is BobCat Ross! Part of my PopCats Sticker set called Painter Buddies that is now available on my website! Link in bio. I think he is my favorite! Sticker #3 is Vincent Van Paw! He is part of my PopCats Sticker set called Painter Buddies that is now available on my website. Link in bio. Enjoy one of my Pop Cats Holiday commissions. I hope you like it! His shirt is my favorite part, love how it turned out. Happy 2018, everyone! Let’s make it awesome! More Mini Pop Cat original paintings for SDCC! Find these and other cuties in Small Press L-08! What person/character would you like to see as a Mini Pop Cat? Here are two commissions of these beauties that I did at WonderCon! 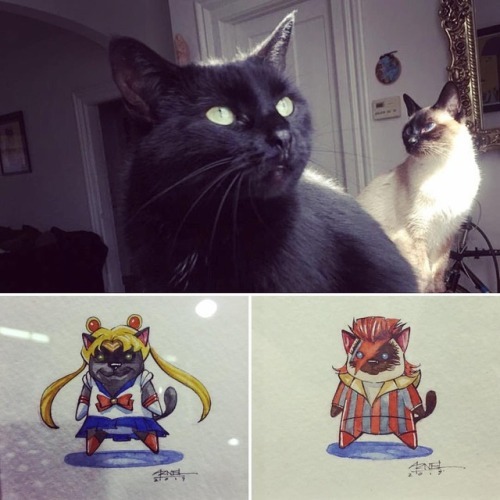 It’s so much fun getting commissioned to do real people’s pets! Thanks to @tootired4u for commissioning me! 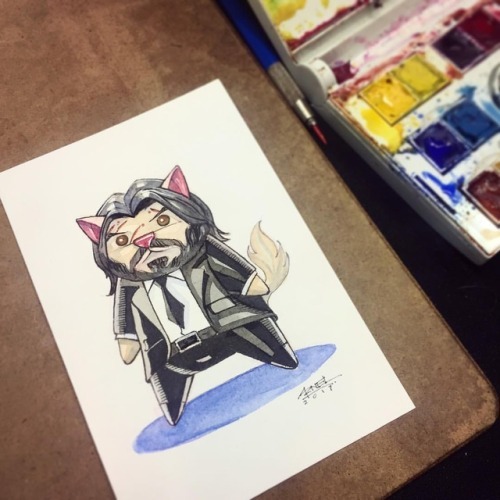 Commission Pop Cat of John Wick at @emeraldcitycomicon booth 411! Only 1 space left for commission work today, so come on by the booth and get yours before it’s too late!